Not Sponsored: Yesterday I spoke to you about Chinese New Year 2019 at Harbour City Shopping Mall in Hong Kong. 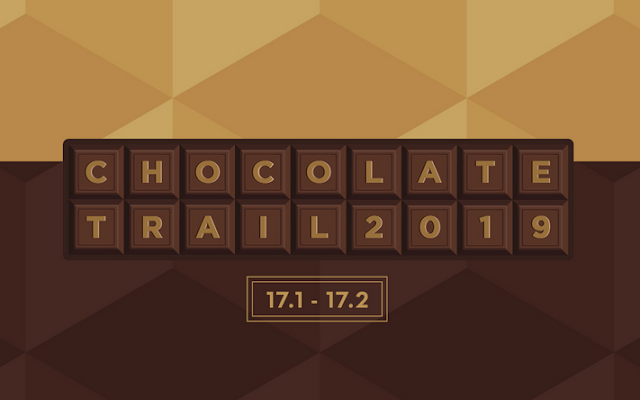 Years ago, I found out about Harbour City through an annual event they hold, called Chocolate Trail (2018 - see last video below, 2017, 2016, 2015, 2014 - here, here, 2013). It actually started in 2010. I always look forward to seeing their chocolate-y ideas. Well this year, they have THREE installations! One, is a chocolate convenience store (ChoConveni). The other is a Create Your Own Kit Kat (pop-up store). Last is a mechanical chocolate machine called The Tipping Point. As always, all are really cute and I love how they are incorporating technology in this event. A cute convenience store filled with everything CHOCOLATE? Yes, Please! HaHaHa It's called World's First Chocolate Convenience Store (ChoConveni). It was designed by a local visual artist, Rex Koo. Its structure is made up of chocolate bars (not real) and there are two chocolate bears in front of the store. 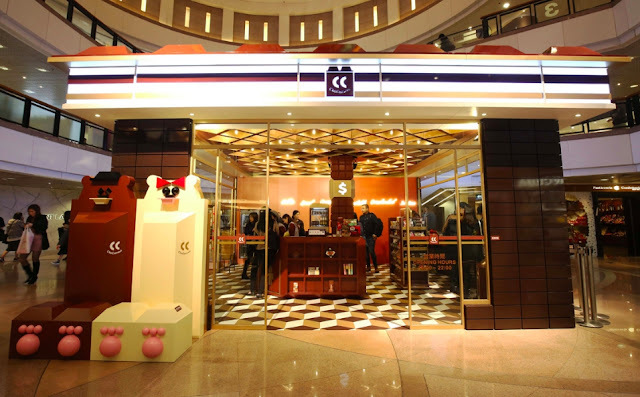 The store contains items you CAN EAT, such as chocolate flavoured cookies and desserts, chocolate infused liquors and milk drinks, and frozen desserts. These are from global destinations around the world. This chocolate convenience store also contains items you CAN'T EAT, such as fine stationery, towels, pencil boxes, cake shaped candles and chocolate magnets. Ohhhh the chocolate drinks. There's also a Create Your Own Kit Kat Tower! 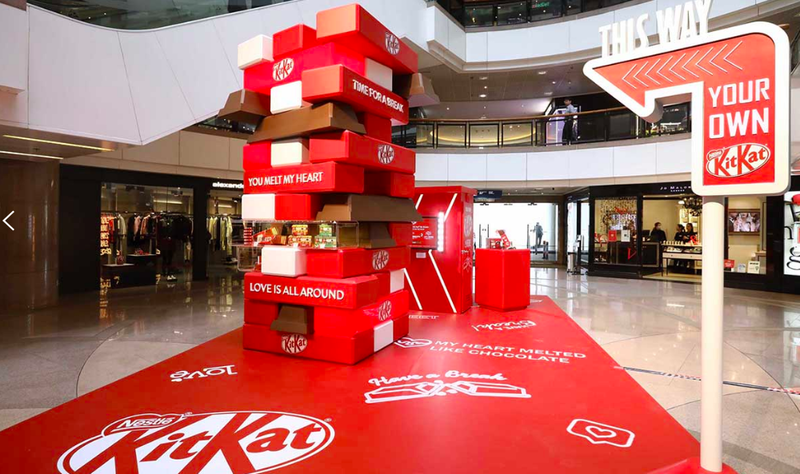 This tower is stacked with faux milk chocolate, white chocolate and wrapped Kit Kat bars. I love the messages on it such as, "Love Is All Around", You Melt My Heart" and "Time For A Break". You can personalize your Kit Kat bar by taking a photo and adding designs. The net proceeds are donated to the Heep Hong Society (a children education and rehabilitation organization). I think that is awesome. And last is an art installation called The Tipping Point: The Chocolate Extravagancy (a Rube Goldberg Chocolate Machine installation). It was custom-made by British installation artist Nick Runeckles. The Rube Goldberg Machine is a massive chocolate art installation that turns a simple task into a fun and lively process through a clever chain of reactions. To see this in action, look at the very first video. “The Chocolate Extravagancy” Machine kicks off with a spiral lift of numerous marble balls through a range of percussion instruments, creating a harmonious symphony. Through a peculiarly complex journey, the balls go into a waterwheel which rotates to grate and shave the chocolate. Visitors can also pull on the interactive “Roller Coaster Marble Ride” panel and send the balls on a musical journey. The gallery also features a “Chocolate Dominos” photo zone, taking visitors deep into the amazing moments of the chain reactions inside the Rube Goldberg Chocolate Machine.